Outside Countryside Elementary School, a new mural sits above a barren piece of dirt and grass. The detailed, colorful mural serves as a prelude of things to come. Countryside has begun plans for a learning garden where students will be able to plant and learn more about the environment. The first piece of the garden was unveiled on June 6. Jackie Stack Lagakos of Perkins Center for the Arts created a mural at the future location of garden. The mural sits alone in the back of the school, but in the coming months, the area around it will be transformed. Lagakos has done other murals for the school before. There are murals both inside and outside the school. The newest mural was done specifically with a future garden in mind. 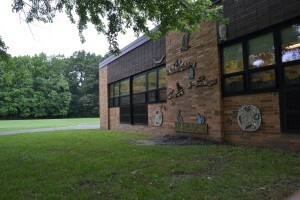 “The mural depicts wildlife,” said Kate Esaia, a parent at Countryside who has been involved with the school’s green initiatives. The mural took 13 weeks to finish. 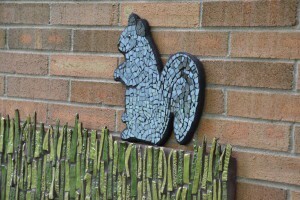 A number of animals are depicted, including a barn owl, cardinals, a rabbit, squirrel, possum, blue jay and timber snake. In addition, the life cycle of a frog and butterfly were included on the wall. The mural is just the beginning of a multi-year project for Countryside. Esaia said the school is planning a garden to be constructed at the mural. The project is part of the school’s science, technology, engineering, arts and math curriculum. Each grade’s portion of the garden will be aligned with its curriculum. Some grades may focus on flowers and herbs, while others may focus on wildlife such as a butterfly garden. All the plans developed this year will be put into practice next year. Some of the work will start in the summer, and the students will fully jump into the project in September. Other organizations have expressed interest in becoming involved with the garden. Arrangements are being made with the Mt. Laurel Garden Club to have members come in and teach classes about gardening. The Mt. Laurel Green Team and Perkins will also help with different aspects. However, the students will perform almost all the actual gardening. Currently, students are creating potential designs. All submissions will be considered for the final garden layout. Next year, the community will be able to follow progress of the garden through a blog. Students will be documenting the entire creation process. The school wants generations of students to use and keep the garden flourishing. Esaia hopes other schools in Mt. Laurel and surrounding towns will follow Countryside’s lead and create community gardens of their own.